Includes Salad, Entree, Dessert, Tea, Coffee, & the Show! 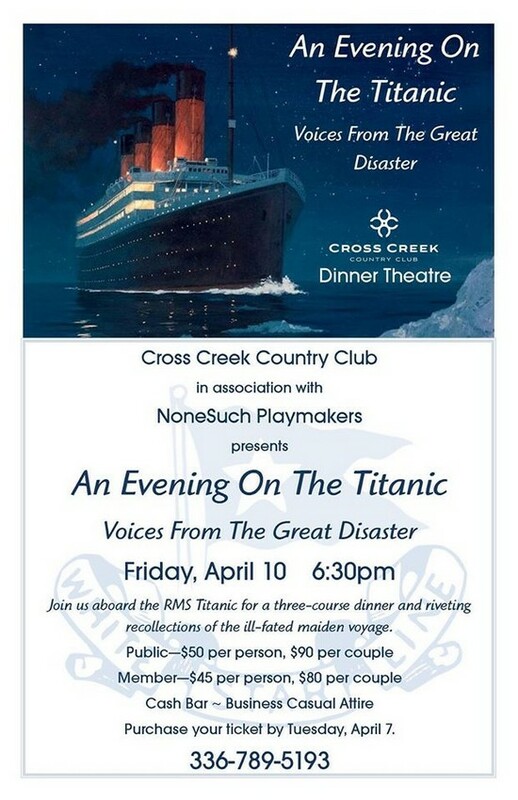 The NoneSuch Playmakers are honored to bring you these voices from the great disaster on the 103rd anniversary of the Titanic's voyage. With the exception of our storytellers and the character of Joseph (who represents the 14,000 workers who built the great ship), everyone you meet during the program was an actual passenger, crewman, or staff member who sailed on Titanic's ill-fated maiden voyage. Their riveting recollections are drawn from historical accounts and sworn testimony. The people - and their stories - are real. We respectfully dedicate our performance to their memory.